Do you, on most days, come back home with splitting headaches and sneeze spells that last for what seems like forever? 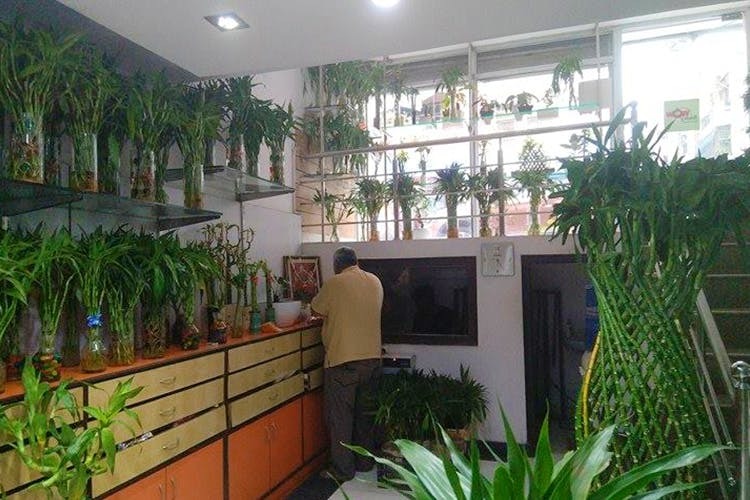 Well, we can’t do much about the pollution in the city but we can help you keep your house naturally purified with these beautiful indoor plants we found at Wow Plants, while taking a walk through the Malviya Nagar Market. They have lots of plants you can choose from. Lucky Bamboo was what caught our eye as it was one of the prominently placed ones. We were told this bamboo actually brings good luck. We suggest you buy a few for your house. We also found different planted ferns, aloe planters, snake plants, English ivy, a variety of cacti and money plants making us feel like we’re in the middle of a tiny jungle! We would recommend their cute little pots and planters you can take your plants home in. They have ceramic planters in the shape of cats, tortoise. They’re perfect for adding a dash of colour to your room or your study. This cute plant shop lies on the brink of the Malviya Nagar market. You cannot miss it while walking through it. Once you get there, we suggest getting some Lucky Bamboo to spruce up your homes and make the air around you more breathable.